Ultrasonic Sensor Quick Start Guide - HRLV‑MaxSonar‑EZ | MaxBotix Inc. This is provided to serve as an easy to use set-up guide for the HRLV‑MaxSonar‑EZ family of ultrasonic sensors, awarded one of the Top 10 Sensor Products of 2012 from Sensors & Transducers Magazine. 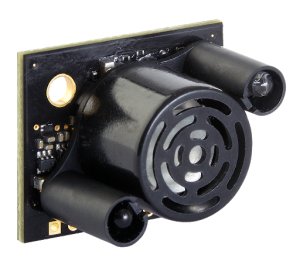 This sensor uses sound to measure the distance to nearby objects and reports the information through one of the three sensor outputs. This quick start guide for the HRLV-MaxSonar-EZ line will help you easily test and use your ultrasonic sensor. This guide is designed to assist you in using your MaxSonar sensor for the first time! Don’t forget to read about MaxBotix being a proud golden sponsor for the FIRST Robotics Competition, where we supply HRLV-MaxSonar-EZ ultrasonic sensors every year to the annual international robotics competition. 1. Disconnect the power supply from any equipment. 2. Turn ON the power supply; set the voltage to 5.0V DC (Volts Direct Current). 3. Turn the power supply OFF and connect ground and V+ cables to the power supply. (Volts Direct Current). 4. Connect the ground from your power supply to the GND pin on the HRLV‑MaxSonar‑EZ. 5. Connect your power supply to +5 pin on the HRLV‑MaxSonar‑EZ. (Volts Direct Current). 6. Turn ON the power supply; verify that the voltage is between +2.5V and +5.5V. (Volts Direct Current). The HRLV‑MaxSonar‑EZ input power should be +5V DC. This system can operate from +2.5V to +5.5V. The current input should read ~3.1mA for +5V DC and ~2mA for +3.3V DC. * You can also connect the ground lead of the multimeter to the GND pin of the HRLV ultrasonic sensor. 3. Connect the power lead of the multimeter to the pin labeled AN on the HRLV‑MaxSonar‑EZ. (To do this we used the orange clips to run from the AN pin to the multimeter probe). 4. 4. The display should read the voltage output of the HRLV‑MaxSonar‑EZ. Because the HRLV-MaxSonar-EZ output is scaled to the input power that is provided to the sensor, it is important to know the voltage scaling before calculating the range. Using Ultrasonic and Infrared Sensors for Distance Measurement. Using Analog Voltage (Pin 3) tutorial. This tutorial also includes examples for using the Analog Voltage output, as well as integrating with a 10‑bit Analog Digital Converter. Please note the sensor resolution, while the HRLV-MaxSonar-EZ line offers a one-millimeter resolution on its digital outputs, the analog voltage resolution is five millimeters. The HRLV-MaxSonar-EZ will, in general, range objects from 0 to 300 millimeters as 300 millimeters. Which corresponds to 292.98mV when powered at +5V DC. 1. It is recommended that you first connect the HRLV-MaxSonar-EZ to either an oscilloscope or a multimeter before you connect the HRLV-MaxSonar-EZ to a microcontroller for the first time. 2. Connect the microcontroller input pin to the desired HRLV-MaxSonar-EZ sensor output pin. 1. Ensure proper microcontroller voltage scaling. 2. Ensure proper voltage scaling of the HRLV-MaxSonar-EZ. 3. Use the proper formula for calculating the distance from the voltage that is read. 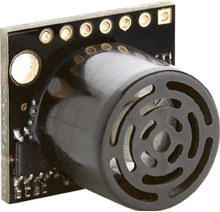 Reference the ultrasonic sensor datasheet. Please note: If you are using a microcontroller to read the AN output, there is a strong possibility that the microcontroller has internal voltage scaling.